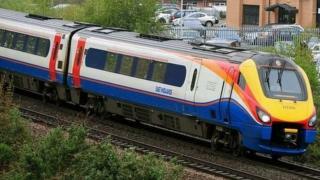 Abellio is to take over the running of the East Midlands railway franchise, the transport secretary has announced. The Dutch government-owned firm already operates five other rail franchises, including Scotrail and Greater Anglia services between Norwich and London. The East Midlands line operates trains between Norwich, Nottingham and Liverpool. The Department for Transport (DfT) said Abellio had been awarded a contract for eight years, starting in August. Stagecoach, the current owner of the franchise was disqualified from re-bidding after the DfT raised concerns about its pension commitments. Announcing the deal the government said the new operators would provide new and faster trains, entirely replacing the existing intercity fleet with more reliable and comfortable carriages. It added passengers should get an 80% increase in the number of morning peak seats into Nottingham, Lincoln and St Pancras. Smart ticketing, a new express service from Corby through Luton into London will be introduced, together with 15-minute delay repay compensation. More than £17m will be invested in improving station facilities across the route, the DfT said. Abellio said it would also be trialling new ways to deliver a cleaner, greener rail network. Transport Secretary Chris Grayling said: "Through zero-carbon pilot schemes, trialling hydrogen fuel cell trains and delivering more seats on modern, spacious trains, the new franchise will also play a major role in building a railway fit for the future." Dominic Booth, managing director of Abellio UK, said it would be spending £600m in improvements which would maximise "the effect of the government's £1.5bn upgrade of the Midland Main Line, to make journeys easier, more reliable and comfortable for our passengers". Abellio said it would be introducing new and faster trains on its Greater Anglia route from next month.